Our club was chartered in 1946 with 21 members. This was long before the Tyee Plaza, Ostler Foreshore Park, Discovery Harbour landfill reclamation works. In those days the waterfront was close at hand, the old Island Highway often ran alongside the high tide mark with the highway frequently blocked with winter storm debris being tossed onto the road. Seaplanes would land in the bay (foreshore area) adjacent to the old Willows Hotel, which along with all the Rotary meeting gear, was destroyed by fire in 1963. In May of 1948 the first Rotary beach cleanup was undertaken. Throughout our history, members have continuously adopted the theme that Rotarians are committed to "putting something back into the community." This has resulted in millions of dollars and tens of thousands of volunteer hours into projects for the citizens of Campbell River. Rotary was the first modern era service club, starting in Chicago in 1905 and expanding internationally into Winnipeg in 1911. 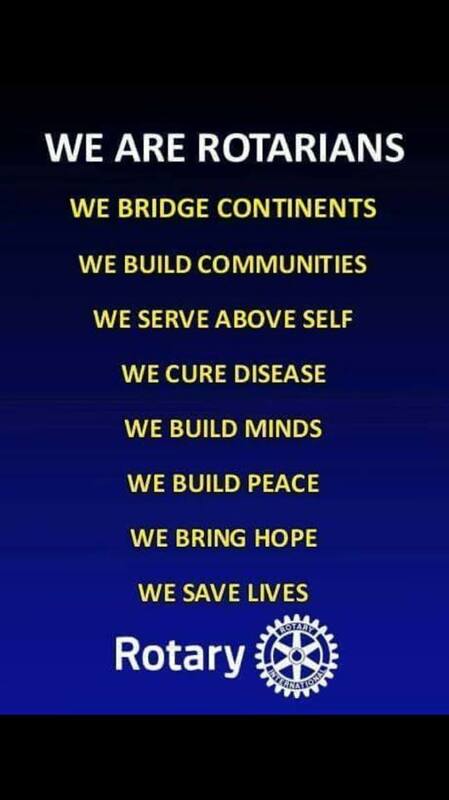 Rotary has five Avenues of Service: Club, Vocational, Community, New Generations, and International. Rotary is an organization of business and professional leaders united worldwide who provide humanitarian service, encourage high ethical standards in all vocations, and help build goodwill and peace in the world. In more than 200 countries worldwide, approximately 1.3 million Rotarians belong to more than 34,000 Rotary clubs. Find out more about Rotary at Rotary Basics. The Rotary motto is Service Above Self. Rotary has a number of guiding principles including The Four-Way Test and Object of Rotary. First formulated in 1910 and adapted through the years as Rotary’s mission expanded, the Object of Rotary provides a succinct definition of the organization’s purpose as well as the club member’s responsibilities. bless us one and all today. which in fellowship is shared. to the service of mankind. To date, the Club itself has contributed approximately $200,000 to International Projects with this total enhanced through contributions by others to over $2,000,00 since 1990. 1990-1991 KIVI, Kenya - Construction of a Water Dam for irrigation. May 2008 - Feb 2009 SAN PEDRO SULA, Honduras - “Six Pieces of Laboratory Equipment” for the Pathology Department of the Mario Caterino Rivas Hospital. July 2009 - May 2010 SAN PEDRO SULA, Honduras - Four (4) Porth-A-Caths for the Oncology Department. Of Mario Caterino Rivas Hospital. June 2010 SAN IGNACIO, Belize - “Dengue Fever Prevention” project for the Sacred Heart College – High School. June 2010 Argentina - Donation to the "Wheelchair Foundation Project" Victims in Pakistan". March 2011 KAKAMEGA, Kenya - "Protected Well Project"
April 2011 Columbia - Daybreak RC's annual "Wheelchair Foundation Fundraising Drive"
May 2011 - SANTA BARBARA, Honduras - "Tierra Blanca Water Pipeline Project". July 2011 - Aug 2012 SANTA BARBARA, Honduras - "Education and Literacy Project"
Feb 2012 NAIVASHA, Kenya - "Borehole Well and Water Storage Project". Apr 2012 Africa - "Tree Planting Project"
Jun 2012 SAN PEDRO SULA, Honduras - "Penitas Arriba Water Project"
Jun 2012 SAN IGNACIO, Belize - "Toilet Blocks for Two Elementary Schools"
Nov 2012 Philippines - "Disaster Aid Canada" for the victims of Typhoon Hayan. Oct 2013 – Mar 2014 Rotary Foundation - "End Polio Now"
Jan 2014 Colima, Mexico - District Matching grant for a "Auto Refractor" ophthalmic instrument for "Project Amigo"
June 2014 Honduras - Pure Water Honduras Project 50 water wells throughout Honduras. Oct 2014 Rotary Foundation - "End Polio Now", Pumpkin for Polio Events. 2015-2018 Mid-Island Group (MIG) - Project support - as a member Club in MIG since 2015, the Club has contributed directly to the following projects: Ghana Blood Bank ($1,250) and Nepal School Rebuild ($1,290) and indirectly to many others. 2015-2018 - Wheel Chair Program - the Club typically contributes $1,500 annually to support the Wheel Chair program. In addition, members have attended distributions in several countries.